ABSTRACT: The approaching 4G (fourth generation) mobile communication systems are projected to solve still-remaining problems of 3G (third generation) systems and to provide a wide variety of new services, from high-quality voice to high-definition video to high-data-rate wireless channels. The term 4G is used broadly to include several types of broadband wireless access communication systems, not only cellular telephone systems. One of the terms used to describe 4G is MAGIC—Mobile multimedia, anytime anywhere, Global mobility support, integrated wireless solution, and customized personal service. As a promise for the future, 4G systems, that is, cellular broadband wireless access systems have been attracting much interest in the mobile communication arena. The 4G systems not only will support the next generation of mobile service, but also will support the fixed wireless networks. This paper presents an overall vision of the 4G features, framework, and integration of mobile communication. The features of 4G systems might be summarized with one word—integration. The 4G systems are about seamlessly integrating terminals, networks, and applications to satisfy increasing user demands. The continuous expansion of mobile communication and wireless networks shows evidence of exceptional growth in the areas of mobile subscriber, wireless network access, mobile services, and applications. Grow rapidly as they become more users friendly. Fluid high quality video and network creactivity are important user requirements. Key infrastructure design requirements include: fast response, high session rate, high capacity, low user charges, rapid return on investment for operators, investment that is in line with the growth in demand, and simple autonomous terminals. As a comparison, the expected best performance of 3G is around 10 bit/s/Hz/km2 using High Speed Downlink Packet Access (HSDPA), Multiple-Input Multiple-Output (MIMO), etc. No current technology is capable of such performance. 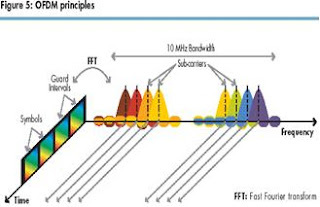 OFDM also provides a frequency diversity gain, improving the physical layer performance. It is also compatible with other enhancement technologies, such as smart antennas and MIMO. OFDM modulation can also be employed as a multiple access technology (Orthogonal Frequency Division Multiple Access; OFDMA). In this case, each OFDM symbol can transmit information to/from several users using a different set of subcarriers (subchannels). This not only provides additional flexibility for resource allocation (increasing the capacity), but also enables cross-layer optimization of radio link usage. • Direct penetration; this is only possible in low frequency bands (significantly Below 1 GHz) and requires an excess of power, which may raise significant Interference issues. • Indoor short range radio connected to the fixed network. • Connection via a relay to a Pico cellular access point. As the history of mobile communications shows, attempts have been made to reduce a number of technologies to a single global standard. Projected 4G systems offer this promise of a standard that can be embraced worldwide through its key concept of integration. Future wireless networks will need to support diverse IP multimedia applications to allow sharing of resources among multiple users. There must be a low complexity of implementation and an efficient means of negotiation between the end users and the wireless infrastructure. The fourth generation promises to fulfill the goal of PCC (personal computing and communication) a vision that affordably provides high data rates everywhere over a wireless network. • Sufficient spectrum, with associated sharing mechanisms. • Coverage with two technologies: parent (2G, 3G, and WiMAX) for real-time delivery, and discontinuous Pico cell for high data rate delivery. • Fixed-mobile convergence (for indoor service).